Kage is a hybrid. His main or base species is that as a tiger, hence why he may refer to himself (and be referred to by others) as a feline or kitty because of this. In reality though, he's part tiger, part dragon and part horse. The parts of him that are an homage to horses are the extra long tufts of fur around his wrists and ankles that are fairly common characteristics of shires/draft horses. Another equine characteristic is that of his hooves. There is another characteristic that is definitely equine in nature but will be revealed on the NSFW version of his ref. Can be a little shy at times. Generally pretty kind and will do almost anything for his close friends. However he can be quite easily annoyed by people who seem to stir up drama just for the sake of stirring up drama. Likes: Sometimes he just loves to sit around and watch a movie and snuggle up with someone. Is also quite an avid gamer and is obsessed with RTS games. Always glad to make more friends. Nothing clever at the moment. Might work on something later on, who knows? Will try to keep this as G rated as possible. I'm a switch by nature. If you don't know what a switch is, then Google it or ask a more seasoned fur. At any rate, because of this, I like to have a version of myself that corresponds with what I'm feeling. Muscular version: When I'm being depicted as a large, muscular guy, that usually means that I'm in a more dominant state, if you can catch my drift. Feminine version: When I appear to be more feminine, then that means that I'm in a submissive state. This is my first (well ok technically my 2nd) upload to IB. This however marks the beginning of me expressing a sincere interest in this site. I've been coming here for the past few years, mainly just to oogle at some of the artwork that artists would rather post here and not on FA or Sofurry due to various reasons, also because some artists sell image packs here. At any rate, I've decided to stop being an elusive creature here and make myself known. As you can see, I have quite a few commissions already uploaded to my FA account. However, I've recently undergone a character change and may not upload all of my "old" commissions to this site except for a select few that I love above all the others. Cause I mean come on let's face it, like parents, there's always one we love more than the other, right? 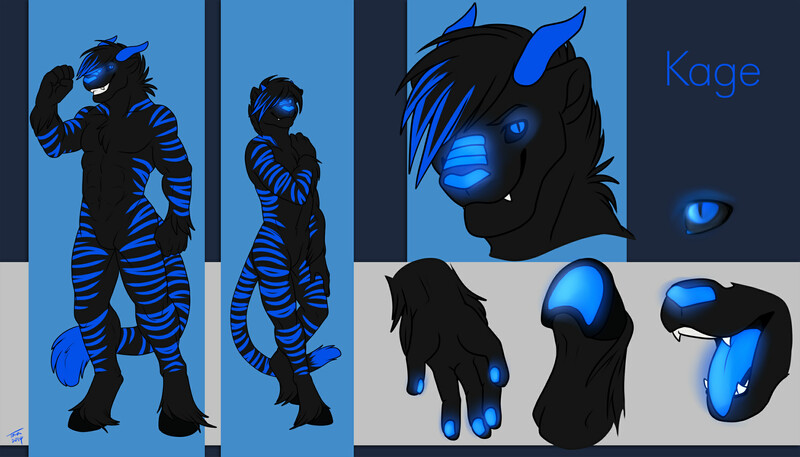 Anywho, I wanna give toraneko some major props for this amazing refsheet. I've had a few done before in the past who've been maimed... like slowly eased into a wood chipper type of maim... And was biting my nails the whole time this was taking place, but to say the absolute least I was very, very happy with these results.